The composition of sand varies and making sure you are using the right type for the job at hand is very important. 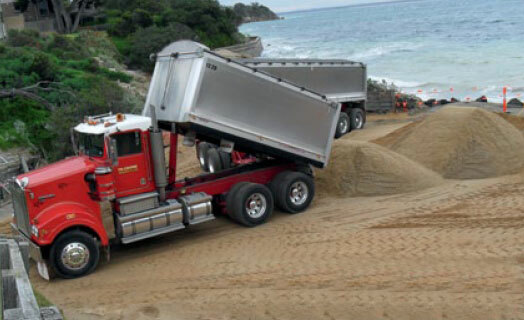 Below is a list of some of the sands used in the building and construction industry, if you have any questions about what sand would best suit your requirements then please call the friendly and helpful staff at Cootes Quarry Products. Concrete sand is Normally naturally occurring washed sand with a particle size less than .5mm. Manufactured sand is normally a quarry dust produced by the crushing of rock. 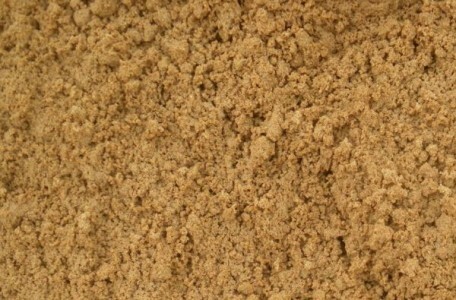 Ménage sand is very fine washed processed sand without stone. Holcim has a wide variety of sands available including ménage sand which is suitable for use in construction of horse arenas and training rings. Turf Sand is widely used throughout the golf and sporting industry, a topdressing material that can be used in a multiple of applications. From top dressing greens and fairways to sports fields and landscaped parklands.Turf Sand is washed and graded sand specifically produced for the horticultural industry. Brick Sand is fine in texture and high in clay content and used in mortar for brick and stone work. Brick sand can also be used in sand boxes and as a base for above ground swimming pools. Filter Sand is sourced fromis normaly sourced from river system, this sand has the ideal angularity, size, spherity and hardness for the most efficient filtering of water. Pipe Bedding Sand is a medium grade washed river sand used for a variety of applications, most commonly in plumbing and as a bed for laying paving. Crushed Rock is exactly what it sounds like, rocks that have been crushed or broken down by crushing machines. Its main uses are as an aggregate for construction and landscaping purposes. Since crushed Rock is produced rather than formed naturally, it can be made in different sizes. Crushed Rock is used in paving blocks and concrete for sidewalks, driveways, patios, homes, office buildings and paved roads as a base or sub-base material or in the process of cement manufacture. 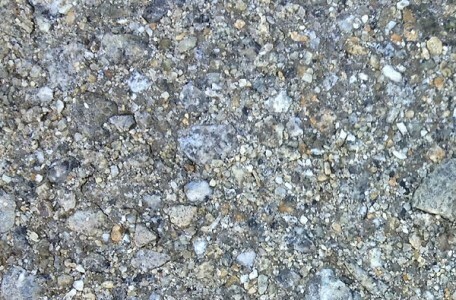 Mixed with a binder to make asphalt and tarmac, Cruched Rock is used for road construction where the strength of the road depends upon the interlocking of the stones due to their angular shapes. Placed on the ground in landscapes around trees, drains and as tracking pads on construction sites. Tracking pads are temporary roadways used to prevent sediment from construction getting on public paved roads or landscaping. 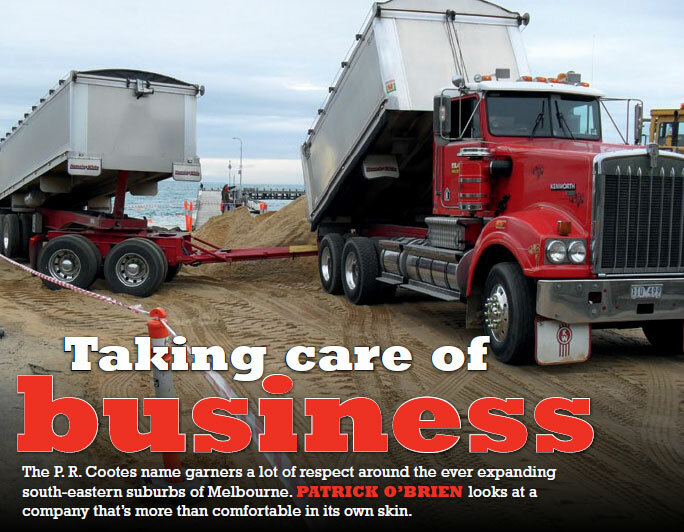 Paul Cootes of PR Cootes Holdings Pty Ltd has been operating Hamelex White tipp ers since becoming involved with CEMEX thr ee-and-a-half years ago, and looks set to add another unit to his fleet. Having been in the transport game for the last 24 years, Paul understands the importance of running a quality fleet that he can depend on. 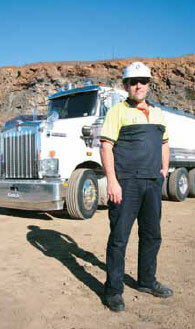 Paul currently runs 13 aluminium tippers, 10 of which have been designed and manufactured by Hamelex White. A new order will bring this figure up to 14. 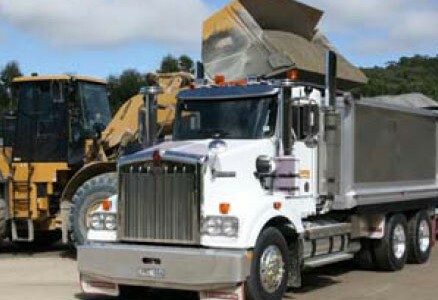 “We have just ordered a PBS approved aluminium quad-tipper that will have a 57.5 tonne gross mass. The design process has already been finalised and it looks likely to be delivered in August this year,” Paul says. Prior to this order, Paul’s most recent addition to his fleet was a tri-axle super dog that was delivered in March and is currently in operation (see box for specs). He says, “It has been performing very well since being put to use a few months ago. This unit is being used to deliver to CEMEX concrete plants and for the crushed rock demand work, largely for road construction, that is running out of CEMEX quarries throughout the south-east of Melbourne. Like a large portion of the vehicles operating under CEMEX, this vehicle has already been fitted with the Body Up alarm system and other unique safety features jointly designed and implemented with CEMEX. “The support we have had from Gary Clarke from CEMEX has assisted us with a continuous improvement approach to the practical design of these assets once operating in the field. Other features include wheel nut indicators, blind spot mirrors, ladder design, grain door latches, and a risk management approach to signage within the cab for body and truck heights as well as overhead electrical hazards.” John Koutsogiannakis is the driver of this triaxle super dog and he couldn’t be happier with the new unit. “Basically, it’s a clean, well built unit. People have stopped me on several occasions out on the road, to comment on how great the vehicle looks and in the two months that this vehicle has been in operation, there hasn’t been an ounce of worry,” says John. The Hamelex White Super Dog This tri-axle super dog measures 5.9 metres long and a sliver under 1.3 metres high. It has been fitted with York axles and suspensions, pre-set hubs, Edbro hoists, Camilleri tarp, CentriFuse brake drums, automatic slack adjusters, and an automatic axle lift which operates through the air bags. When the trailer is laden, the axle lift senses the pressure on the air bag and duly lowers the axle; when the trailer is unladen, the axle notes the reduced pressure, thus enabling the axle to lift off the ground, therefore reducing tyre wear and increasing fuel economy. To finish, the super dog is fitted with Alcoa aluminium wheels, Durabrite polished on the outside, and Michelin XTE2 tyres. Hamelex White prides itself on its reputation for building strong and innovative equipment. Attention to design and a strong customer focus allows Hamelex White to cater for a wide range of unique requirements, using a mix of aluminium and steel blends. As one of Australia’s largest trailer manufacturers, Hamelex White’s trailers are backed up with the experience and expertise of a large number of distributors across the country and are all supported by a two year warranty. A quick look at its vehicle fleet can reveal much about a firm’s approach to business. Take the Cootes Quarry Products’ line-up, for example. It comprises 19 truck and dog tipper combinations with trailers of varying descriptions, including one five-axle, half a dozen tri-axle and 12 quad-axle units. Continuing the diversity, the equipment comes from a trio of trailer manufacturers, namely Hercules, Hamelex White and Chris’s Body Builders. 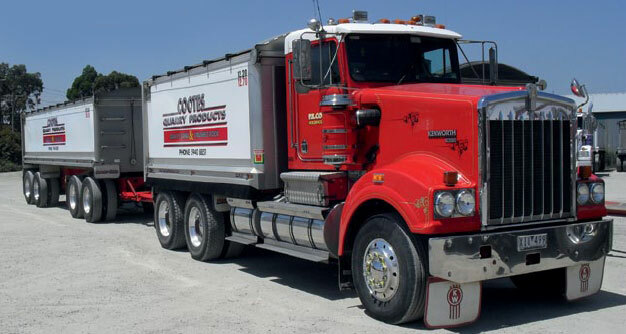 The majority of the fleet is signed up for sub-contracting work to a couple of concrete producers, with Cootes supplying nine vehicles and drivers to Holcim and three to Broadway & Frame. The remaining seven are dedicated to Cootes’ own work in what has become a fairly sizeable customer base. The jobs include quarry work for the new estates populating Melbourne’s south-east, road extensions, garden supplies and even repairing beaches along the Mornington Peninsula. come up often when speaking with Leigh, seemingly representing the building blocks of the company’s ethos and the motivator behind how everything is done. For instance, presentation is of utmost importance for Leigh and the company’s owner Paul Cootes. It stands to reason though because Paul is, in fact, the son of Ian Cootes whose fuel and gas haulage operation was famous for its pristine presentation of trucks and tankers. However, as Leigh points out, presentation extends beyond the customer base to the general public as well. That’s why a Hercules bodied truck will only be seen hitched to a Hercules dog, a Hamelex coupled with a Hamelex and so on. Plus, each vehicle is cleaned and polished every day before it hits the road, always giving the right impression when it’s out there doing the work. This commitment to raising standards is also seen in the approach Cootes takes to its apprentices. 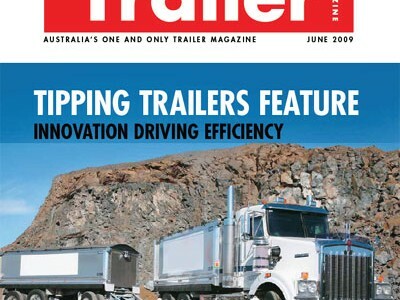 The reality is that along with assing on the values that define the Australian trucking industry – including quality service, innovation and reliability – companies like Cootes are responding to the new challenges facing the next generation. At Cootes, for example, an apprentice can be found helping take care of the truck and dog combinations every afternoon and Saturday morning. The drivers will usually get back to base around 3.00 pm and team up with the apprentice to wash and polish the vehicles. In this way, the older generation is teaching the next one about the importance of having pride in what they do. 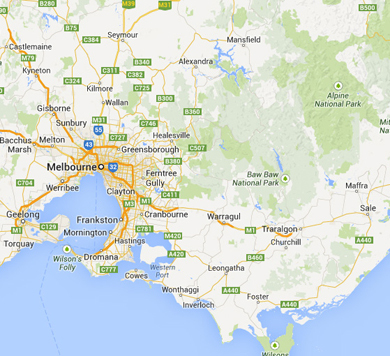 The sizeable area covered by Cootes – from Hallam in Melbourne’s south-east and much further east to Bairnsdale and up into the steep hills around Myrtleford – obviously includes a significant number of roads through a few different shires, each with their own rules and regulations. With this expansive reach comes the onerous task of paperwork, which becomes further complicated when PBS (performance based standards) is thrown into the mix. Yet, as Leigh explains, the extra payload makes it all worthwhile. Craig Wallace, general manager of Hamelex White, says that for a manufacturer like Hamelex White the main difference in the bigger builds is in the overall size increase – everything else is simply business as usual. “The drawbar bushes and the rest of the running gear are just the standard components we’ve always used,” Craig confirms. “It’s probably fair to say that we’ve always chosen gear that will stand up to a bit more weight, anyway. “But like Cootes, we’ve noticed the brakes are wearing somewhat quicker than normal. Tyres are also wearing a bit faster as well, usually needing replacement around the 90 to 100,000 km mark. We’ve had a few comments about the tyres, but when you’re carrying extra weight you just have to accept that this is going to happen to a certain degree. It’s not a fault in the design of anything.” Alan Beggs, Hamelex White’s service repairs manager, adds that it’s the single operators who are raising questions more than the bigger players. Going from six-axle units hauling 45 tonnes to seven-axle combinations with 57.5 tonnes is a big jump. The bigger fleets seem to have realised that with extra payload comes extra strain on the vehicles. The obvious response is to increase the frequency of maintenance schedules. “I think that’s probably the best advice,” Alan adds. “We don’t feel we need to send any specific feedback to our suppliers. Overall the PBS builds are going very well and the tyre and brake manufacturers are always improving their products.” A great tip. ABOVE: The PBS approved four axle dog trailer has further increased productivity levels of PR Cootes Holdings Pty Ltd.
Hamelex White is highly regarded for delivering quality tipping solutions based on performance and durability and now, through the PBS (Performance Based Solutions)assessment program, customers such as PR Cootes Holdings Pty Ltd, who recently added a PBS approved four axle Hamelex White Dog Trailer, have the opportunity to further increase the productivity of their quipment. For the uninitiated, PBS (Performance Based Standards) offers the potential for heavy vehicle operators to achieve higher productivity and safety through innovative vehicle design. These gains are typically not available under conventional ‘one size fits all’ prescriptive mass and dimension rules or the state-based permit system. Applications for SMART heavy vehicles are considered by a PBS Review Panel (PRP). The Hamelex White four axle dog aluminium trailer has been an important addition to the PR Cootes Holdings fleet of 15 trailers, as it is being used to cart quarry products around eastern Victoria for Holcim Australia Pty Ltd, one of Australia’s leading suppliers of aggregates, concrete and other related products with over 100 years of experience. With over 24 years of experience, Paul Cootes is no stranger to the transport industry, and running a safe, efficient and reliable fleet is always high on his agenda. His business practice thrives on continuous improvement and Paul will only place a driver that has a Multi Combination licence into any of his PBS vehicles, as they are carrying similar weights to a B-double. TDT Driver Training in Dandenong recently provided three of Paul’s drivers with the MC endorsement, which heavily focuses on route planning and other skills that complement vehicles carrying higher mass weights. “The PBS scheme does not require an MC licence as part of the criteria, but from a best practice point of view, I believe it to be beneficial,” he says. This new tipper is the fourth PBS approved unit purchased by PR Cootes Holdings Pty Ltd, all of which were designed and manufactured by Hamelex White. The first three PBS approved units have a 56 tonne gross mass, while this is the first to have 57.5 tonne gross mass, enabling it to carry up to 40.6 tonne payload. 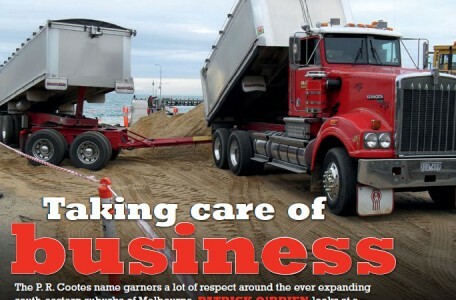 Amongst those impressed with the capabilities of the new trailer is its driver, Sebastian Kuyer who says, “It actually handles better at 57.5 tonne than it does at 50 tonne.” PBS certifier, Bisitecniks played a large role in enabling the PR Cootes Holdings Pty Ltd units to obtain PBS permits. “The main elements of PBS approval are vehicle access in terms of where the vehicle is permitted to travel; specifications, which need to go into great detail for the assessment; the inspection of the equipment; and the final approvals and permits,” explains Paul Walsh of Bistecniks. “For any vehicle that can’t comply with the prescriptive regulation, PBS is really the only avenue available, and what PBS approval generally means is higher productivity. The types of vehicles that PR Cootes Holdings Pty Ltd operates are achieving significant increases in weight because of PBS.” As part of providing enhanced safety, the four axle dog trailer has been fitted with a body-up alarm system. This system provides drivers with an audible and visual alarm to indicate that the tipper body is elevated and helps prevent it from contacting overhead hazards, including powerlines which can cause a significant risk to the driver. This system works through the truck hydraulics and registers any pressure on the hoist, which triggers the audible tone and LED display in the cabin of the truck. An additional mirror has been fitted at the front of the truck to eliminate blind spots. Further to this, extra lighting helps to provide increased visibility. The tipper has been fitted out with Narva LED stop/tail lights, side lights, and reflectors to the rear and sides. “Hamelex did a very good job in building the unit to exacting specifications which is vital when seeking PBS approval,” states Paul Cootes. “It’s a very precise methodology so you need everybody to do their job to the millimetre. I would like to acknowledge the cooperation we had between Hamelex White, its suppliers and the consultant Bisitecniks in order to get these approvals and get the unit out on the road.” Hamelex White has a proud and long-standing relationship with PR Cootes Holdings Pty Ltd, and focuses on delivering the same quality of work and ongoing service to all transport operators who require customised trailer and tipping solutions.